Lucio Fontana, Spatial Concept, 1959, Courtesy of the artist. 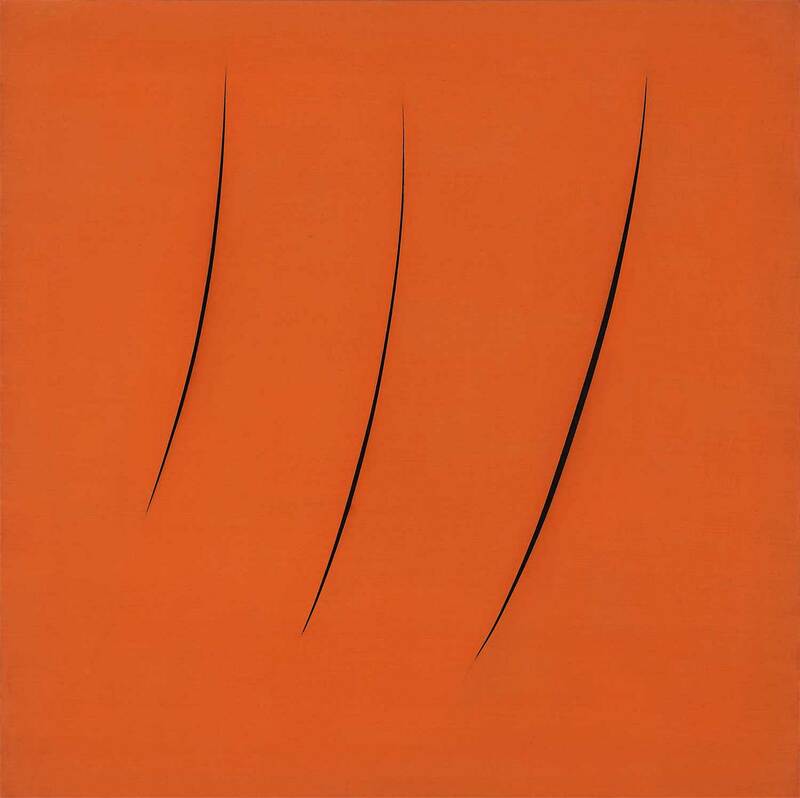 Among the many figures of Italian art of the past century, one of the most internationally famous is, without a doubt, Lucio Fontana (1899–1968), renowned for his “cuts” on canvas. In New York, in collaboration with the Fondazione Lucio Fontana, the Metropolitan Museum of Art has dedicated a show to the Italian-Argentine artist that focuses on the variety of materials and expressive modes that characterize his work. Furthermore, the show’s title — “On the Threshold” — aptly suggests the sense of openness that served as the basis for much of his production. The nucleus of the exhibition is at the Met Breuer, spread over two floors. Only one piece can be found at Met Fifth Avenue, Neon Structure for the Ninth Milan Triennial (1951), occupying the Helen and Milton A. Kimmelman Gallery; meanwhile the artist’s Spatial Environment at Documenta 4, Kassel (1968) is on display at El Museo del Barrio. However, it is the works exhibited at the Met Breuer that deserve the most attention, since they provide a more complete idea of the Spatialist master’s output. On the third floor of the Breuer, the layout is divided into six sections: sculpture, ceramics, holes, matter, cuts, and reflections. In chronological order, the installation sharply highlights the tendency to work in series — an aspect of much of the artist’s production — culminating with his “Spatial Concept” works (which cover a time span from 1950–68). In this regard, it is interesting to corroborate his serial tendency by looking at other, lesser-known phases of his career, such as at the section dedicated to ceramics, in which sea creatures seem to have imploded — at least from a figurative point of view. These are a group of works resulting from a 1935 collaboration with the Manifattura Giuseppe Mazzotti, a Futurist-run business. Lucio Fontana, Spatial Concept, 1962. Courtesy of the artist. Lucio Fontana, Spacial Concept, The Bread, 1950. Courtesy of the artist. Lucio Fontana, Portrait of Teresita, 1940. Courtesy of the artist. Lucio Fontana, Olympic Champion (Waiting Athelete). Courtesy of the artist. Of course, seriality is not the only characteristic to emerge out of the exhibition. The anthological approach of “On the Threshold” allows another aspect of Fontana’s modernity to be highlighted: perhaps best defined as the blurred distinction between presence and visibility. In a field like sculpture, Fontana seems to leave the impression of using materials — ceramic, but also terracotta, mosaic, and others — that give way to halfway-emerging faces and bodies, unfinished. Yet in his paintings, the cuts and holes on canvas prompt the viewer to conceive of an idea of the image, outside of the picture frame. Ultimately, the spatial environments remind us of what we are: alienated subjects. Accompanying the exhibition is a catalogue that includes several texts useful for later in-depth analysis. Among the most interesting is surely that of Pia Gottschaller, author, among other roles, of The Artist’s Materials Series, a study devoted to the artist, released a few years ago by the Getty Conservation Institute; or, perhaps, occupying a different interpretive level altogether, is the contribution of Enrico Crispolti. In addition, there have been several other recent publications that provide a range of interesting readings of Fontana’s work — Marshall Plan Modernism by Jaleh Mansoor, for example.